Jordan comes from the steep streets of Pittsburgh PA, where he learned to dodge cars and rip single track. He has been involved in nearly every aspect of the cycling industry: from turning wrenches, store design, clothing production, and bike park creation. Jordan spends his free time racing cross country and cyclocross around North America, though he has been know to enduro every now and then. His love of cycling is only second to his love of his family and punk rock. His love of athletics and sport started as a four-year-old hockey player from Aliquippa PA. A love of training and pushing his limits landed him on the Amateur Penguins and elite amateur teams in New York state. Jordan spent most of his teenage years traveling North America playing hockey and learning how to train and play like a professional. In college, Jordan traded his skates for two wheels. His love of racing started as a bike messenger racing alley-cat after alley-cat. That casual racing quickly turned into an obsession and Jordan found himself racing two to three times per week. 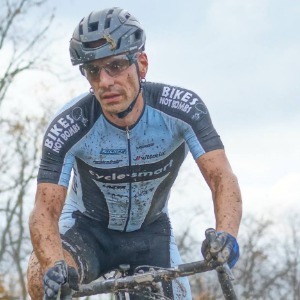 After many years of the same pattern, Jordan was racing pro mountain bike races in the summer and UCI cyclocross in the fall. Jordan is has been a cat1 road/cyclocross and pro mountain bike racer. He has also been a drummer in several punk bands throughout the years. Jordan's newest chapter is that of a father, coach, and mentor. He now spends his time racing for the Cyclus Sports domestic elite team in the spring/summer and cyclocross in the fall. Jordan is currently accepting new clients, those looking to balance cycling and parenthood, as well as athletes of all skill levels, ages, and disciplines. Success. Coach Jordan Villella has been notified of your message.